Observed on the Purnima (full-moon) night of the month of Vaisakha (either in April or May), Buddha Purnima commemorates the birth anniversary of Lord Buddha, one of the greatest spiritual leaders the world has ever beheld. Celebrate this wonderful occassion with an elegant, thematic crossword puzzle from TheHolidaySpot. This Buddha Purnima Word Search Puzzle is intended to provide you some intellectual entertainment and is in keeping with the spirit of the occassion. 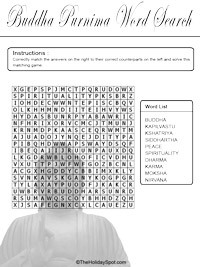 Attempt our Buddha Purnima Word Search Puzzle, have a fun time yourself and also click here to share it with your friends. Wish you a happy Buddha Purnima! 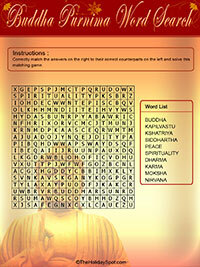 Make this Buddha Purnima more memorable for yourself with this exquisite word search puzzle themed to the occassion! Just follow the printing instructions, take out a print of the puzzle template from below and find certain words out of a jumbled arrangement of letters. All the words that you have to find out are connected in some way to Buddha Purnima and have purposely been concealed in every possible direction - horizontal, vertical, diagonal, forward or backward. Try and find out all the listed words. Mark out every word you spot with a pen to seperate from the jumble. Get going! Click on the thumbnail image of the Word Search template to open it in a new window. To print the puzzle template, click on the "Print" button provided in the new window or go to the upper left corner of the window and click File>Print. To know how your printout will look like, click on File>Print Preview before you actually issue a print. Close the template window after you have taken out the print to return to this screen. Start solving the puzzle from your Word Search printout. NOTE: Set page margins to zero if you face difficulties fitting the template on one page (FILE, PAGE SETUP or FILE, PRINTER SETUP in most browsers).